What has happened to the Citrus Swirl? I want to use stronger language here, but we’re House of Mouse squeaky clean here. I stopped by on Saturday morning expecting my favorite frosty treat. I noticed the price had gone down a bit, finally some respect, I thought. Then they serve me my Citrus Swirl in a little cup and my heart sank, I was devastated. No longer was there a shockingly orange glow on the one side of my cup. No longer could you smell the orange concentrate from across the table. No longer was it a citrus Swirl, I don’t care what they actually call it. What sat before me was a combination of vanilla soft serve and what I can only describe as orange sorbet. It was no longer orange in color either, now there was only a blush of peach mingling with the ivory of the soft serve. When asked what had happened to the old recipe the cast members, likely new to the Sunshine Tree Terrace, acted like nothing had been changed, so far as they knew. And, in their minds, they were probably right; the recipe hadn’t changed since they had been there. As I walked away I took a second to glance back, I hadn’t stopped to really read the menu before I hurriedly placed my order in frantic anticipation, and thought that it would probably shed some light on my quagmire. Instead, what I found left me with the greatest of the bitter pills I had been forced to swallow in the past few minutes. The description of the Citrus Swirl had not been altered. It still said orange concentrate and soft serve. Now, I grew up in Florida, next to an orange grove for that matter, I know orange everything, and what I had just been forced to ingest was not orange concentrate. I was left speechless, but only momentarily, before I started griping and grumbling to any one who cared to listen. It would have been a travesty, but at least a bearable one, had they actually made the appropriate changes. Yet they were still trying to pass off this farce as the delicacy I had enjoyed for years. It almost ruined my morning. If you ask my honest opinion, it is just a conspiracy from the Anti-Citrus Swirl Pro-Dole Whip assembly, remember, they are well sponsored after all. I totally notice the difference a couple months ago. 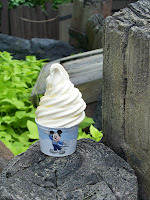 I was a huge fan of the original swirl, not so much a dole whip aficionado. I was sick after my first bite of this new concoction. An the service at the terrace is terrible at best, to top it all off. Very disappointing. Let's start complaining to WDW. Save Our Swirl!